Genesis Shadow of the Beast (USA) in 11:56.9 by maTO. 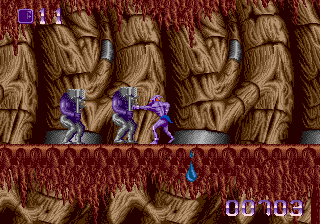 Shadow of the Beast is a somewhat inferior port of the Amiga hit released in 1989. The North American release was additionally criticized for sloppy conversion that made the game run 16.7% faster than intended and, as a result, sharply increased its difficulty. Obviously it was no problem for maTO, who plunged through the game with impressive health management in just under 12 minutes.